NEW DELHI— Married at 14 to a man almost twice her age, beaten almost to death within a year of their marriage, and then abandoned as a mother at 15, Sunita Choudhary is now an empowered women’s rights activist. 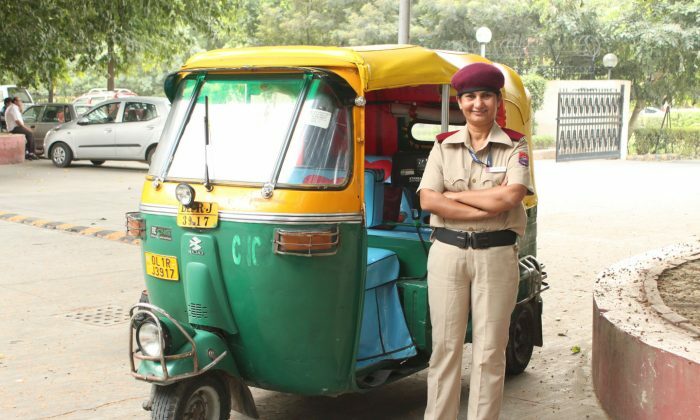 And she may be the only woman in New Delhi who drives a three-wheeled taxi, or an “auto” as it is called in India. 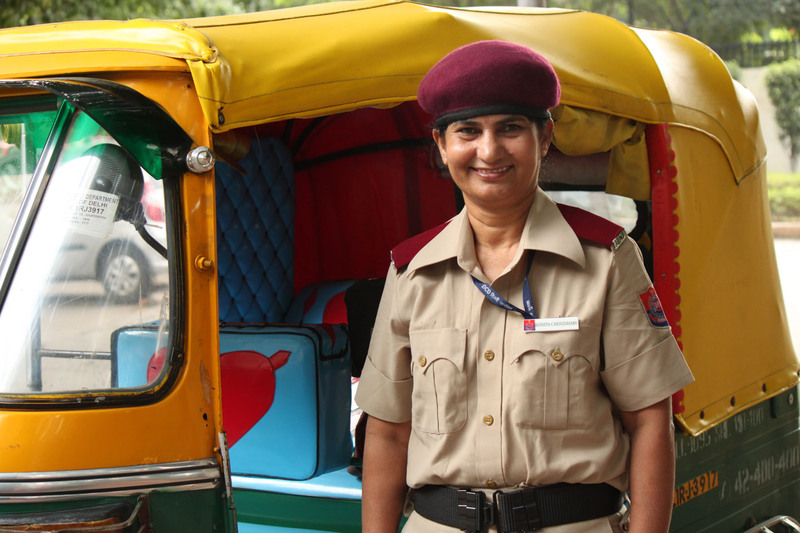 “I’m the only woman auto driver in the city among 100,000 male drivers,” she said confidently. She started this job as way to make money while fighting court cases against her husband and in-laws. “My in-laws always complained that I didn’t get enough dowry. They wanted a car from my parents,” she explained in Hindi. “One day my husband and his friends asked for an outing to Agra [the city where the Taj Mahal is]. On the way, they forcibly took me to the jungle, tied me, and beat me very badly with sticks. They were digging my grave in the dark when I regained consciousness and escaped,” recounted Choudhary with tears in her eyes. Choudhary endured many misfortunes very early in life. She had a child at 15, but was advised to abort the child because it belonged to her abusive husband. Choudhary refused after seeing the abortion instruments in the hospital and decided to keep the child. “Seeing those things, I felt very afraid,” she recalled. She had her son, but he was very sickly, and died at 8 months old. After her in-laws attempted to kill her, Choudhary left the village where her family and husband lived and moved to Delhi. For years, she worked as a helper in homes and in various factories to support herself. “I was fighting a court case against my husband then and had to miss work and was losing money. I then thought about working as an auto driver as it would allow me the flexibility to earn money when I wanted,” she said. She had to travel a lot because the court case against her husband was transferred from Delhi, where Choudhary lived, to neighboring Haryana State. Her in-laws tried to win the case through bribes, but were unsuccessful, and after a 12-year struggle, Choudhary won. Her husband was sent to jail and forced to pay her alimony. What made this hard time in her life all the more difficult is that Choudhary did not have the support of her own family. “In my community they say once a woman enters her husband’s home, she should only come out as a dead body,” she explained. It speaks to her character that, after all that has happened, she still takes care of her parents. “Life is hard. It teaches one to live,” said Choudhary, who is now 35 years old. Choudhary has been driving a three-wheeled taxi in New Delhi for 10 years now. It is not considered a suitable job for women in India. Unlike other taxis, it doesn’t have doors and thus, less protection. Women driving car taxis has become more common, but women driving three-wheeled taxis are a rare sight in India still. Thus Choudhary had to break through many barriers when she first started. Nobody wanted to rent her a vehicle or give her a loan to buy her own. In fighting for her case, Choudhary wrote letters to India’s prime minister, India’s president, and the chief minister of the state of Delhi, who is also a woman. Thanks to the intervention of the chief minister of Delhi, she finally got a loan at a subsidized rate. She has since paid it off and now owns her own her taxi. She said she hopes more women will take up the profession because it is a good way to make money and can help women support their families. Choudhary dedicates her time and resources to helping others whenever she can. She is part of a citizens defense force, trained by the Delhi Police for Civil Defense, and as part of that, supports accident victims, firefighting groups, and others in need on road. She is also often seen on Jantar Mantar road, New Delhi’s popular activism and protest spot, supporting activists with medicine, free rides, or words of support. Choudhary has political ambitions. Her reasoning is that, if she is in a higher position, she will be able to help more people. For many years, she has been contesting as a candidate in the Indian Parliament and the Delhi Legislative Assembly elections. “I contested in the Lok Sabha [lower house of the India Parliament] elections because, still today, we don’t have a woman vice president in the country,” she said. She believes women should be granted 50 percent of the reserved seats in some tiers of the Indian government so they can represent women’s interests. Choudhary hesitated to share that she got only 600 votes from the New Delhi constituency in the 2014 elections. “[But] I got 1,500 votes in the last  elections,” she added emphatically. As for marrying again, she said she is open to the idea, but is still haunted by her past. “I love my work. I’ll marry that person who loves my work,” she said. Here in India’s capital, the government has taken protecting trees to a new level.